Teeth become damaged and decayed all the time, and some even go missing altogether! If you’re currently dealing with any of these problems, thanks to Aegis Dental, they can now be fixed in just two easy visits to our office using crowns and bridges. They are two of the most commonly used restorations in all of dentistry, and with them, we can make a damaged tooth look like new again and quickly close the gap left by missing teeth. 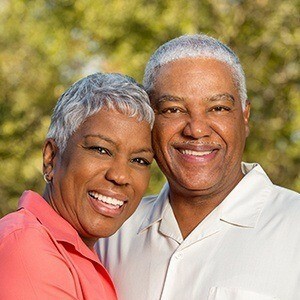 A dental crown is a tooth-shaped “cap” that is simply placed over the top of a compromised tooth. We usually use them to restore large cavities, fractured teeth, and even stained or misshapen teeth to cosmetically enhance them. They can be made of a variety of materials based on which tooth needs to be repaired. 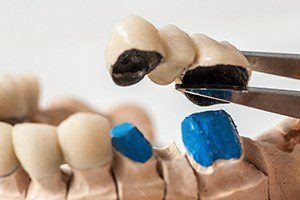 Strong, full-metal restorations provide strength for the back teeth that are exposed to the greatest chewing forces throughout the day, and all-porcelain crowns provide the beauty and natural appearance needed for the front teeth. Every crown we provide is completely custom-made to blend in with a patient’s smile, and it typically takes just two simple visits to get one. 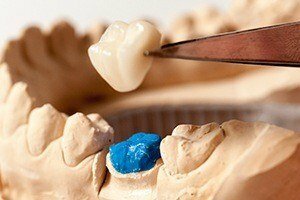 A dental bridge, on the other hand, is a kind of prosthetic we can use to replace a single missing tooth or a few in a row. It consists of a prosthetic tooth or teeth that are supported by neighboring crowns. To get one, two crowns are placed on the teeth on either side of the gap in a patient’s smile, and the new teeth are bonded directly to them. This not only helps the appearance of the smile, but it also ensures that the bite is evenly distributed, plus it prevents the other teeth from shifting out of place (which happens often after tooth loss). With crowns and bridges, we can turn back the clock and make it seem like nothing bad ever happened to your smile. To learn more about them or schedule an appointment, contact us today.